Hello all you Technique Junkies fans and blog friends! It's so refreshing to be working with pastels in my craft room and on my projects these days. Winter is long here in Maine....we create our own pick-me-up moments. 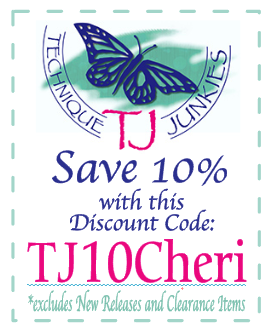 I've got a pick-me-up for you....with a 10% discount on your entire order of Technique Junkies Stamps. Just use my discount code (TJ10CHERI) at check out and "bam"...10% off all your stamps. To create this card I did a color wash for the background (it's not watercolor paper, so I had to be careful to not use much water). 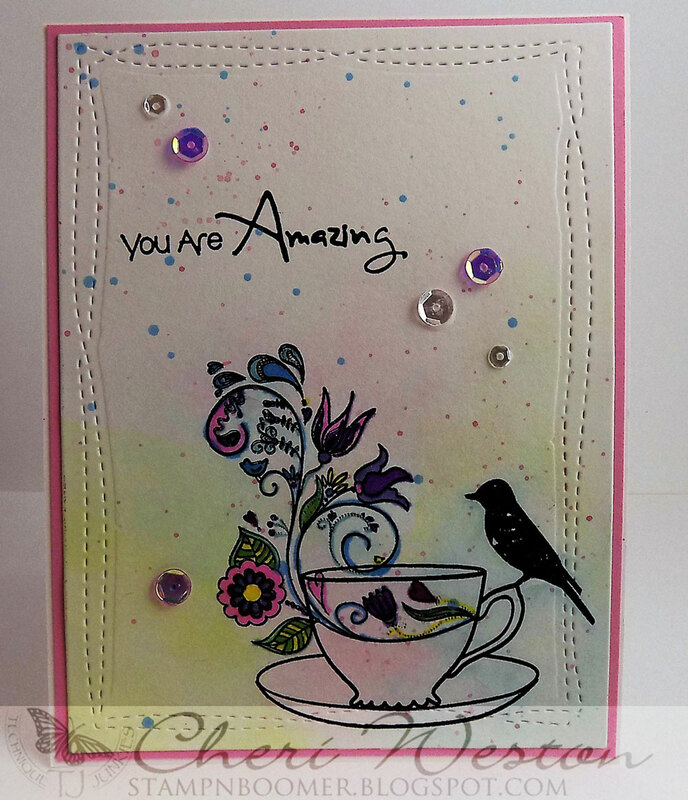 The stamp is one of my all time favorite TJ stamps, "Afternoon Tea" and the sentiment is "You Are Amazing". I colored the image with my Chameleon Colortone Pencils then added some light splatters with some of the same watercolors I'd used in the bg wash. Thanks for stopping by and don't forget to use my discount code if you'd like a 10% off your entire stamp order at Technique Junkies Stamps. Why, thanks Cheri. haha- really it's another great card you made! 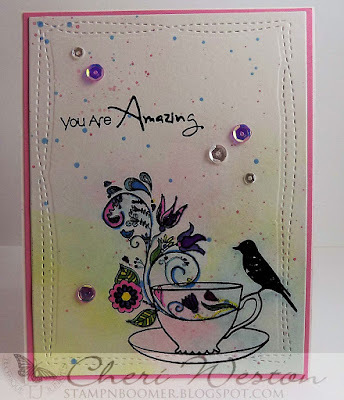 Very pretty - love the light watercolor wash.
Gorgeous soft background for that beautiful stamp. So lovey SS. Very nice card. I have this stamp and also really like it. Your background is very nice, especially with the splatters.